Ennis welcomes ‘Up with People’ European Alumni Meeting (EAM) delegation to town this weekend. The official programme of events for the 270-strong delegation is centred on meetings and organised activities from Friday April 12 – Sunday April 14, but as many as 200 of the delegation had already arrived in Ennis by Wednesday April 10thand many will remain on after Sunday. “I have had the pleasure of assisting Mary McCullough and the EAM team over recent months as they planned details for this large inbound event to Ennis”, said Margaret O’Brien of Ennis Chamber. “The 270 delegates represent 27 nations, but that was only the start of the logistics. Accommodation, dining, activities, day trips and other details all had to be meticulously planned by Mary. 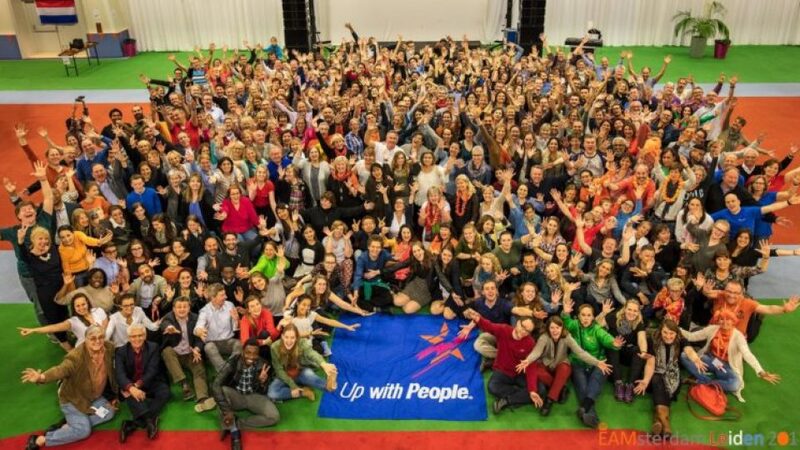 In addition to the European Alumni Meeting, the Governing Board of ‘Up with People’ (UwP), headquartered in Denver, Colorado, USA will hold their first board meeting outside the US in Ennis on Sunday April 14. Board members and partners checked into the Old Ground earlier this week and will stay in Ennis until Tuesday April 16. Mayor of Ennis, Cllr. Clare Colleran Molloy will officially welcome delegates at a registration ceremony at Temple Gate Hotel, 4.30pm on Friday. UwP have a tradition of aligning with and fundraising for a local charity when visiting an area. On Saturday April 13th, a ‘Big Busk’ is planned for 1pm, in the courtyard outside Temple Gate Hotel, featuring UwP Alumni, followed by ‘Socks in the Frying Pan’ and ‘Ennis Gospel Choir’. Mayor of Ennis, Cllr. Clare Colleran Molloy will MC. Funds raised from this event and the follow-on busking (un-plugged!) around town until 3pm will all go to TLC4CF (Tipperary, Limerick Clare Cystic Fibrosis). Who are Up with People? When Up with People was born in the USA in 1965 – formed out of a summer youth conference – its early leaders discovered the power of music for bringing together people of different mind-sets, cultures, ethnicities, and beliefs. Up with People took to the streets and soon became a global music and education phenomena, inspiring communities with a message of peace and unity. Over time, Up with People grew to be known worldwide for bridging cultural gaps and participating in international relations and education. To this day the unique blend of music and social action provided by Up with People creates the chance for youth to develop a new understanding of the world, recognise the responsibility they have to others, and become global citizens by acting as positive agents of change.